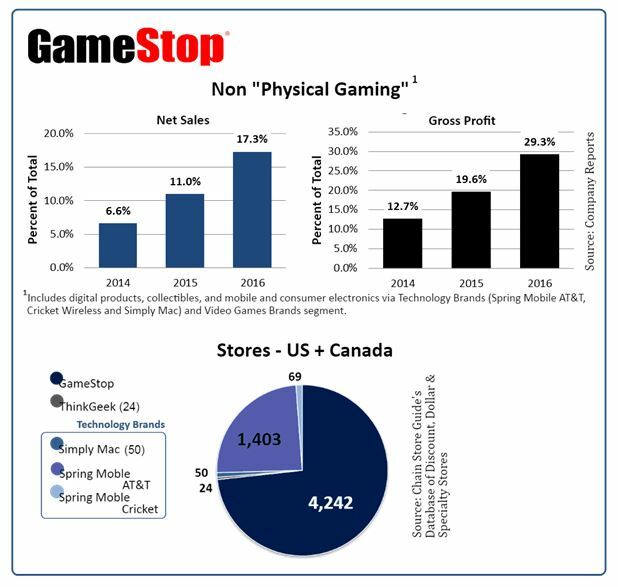 GameStop’s release of its Fiscal 2016 results (FYE 1-28-17) a few weeks back provided interested observers with new insight on its ongoing efforts to diversify its core business, efforts Chain Store Guide first reviewed last summer (“GameStop Doubles Down on AT&T”). The company’s stated goal is “to have 50% or more of our operating earnings for the 52 weeks ending February 1, 2020 (“fiscal 2019”) come from sources other than ‘physical gaming’”. Taking a look at non “physical gaming” net sales and gross profit data from the last three years, we can see progress. As a frame of reference, GameStop’s 2016 net sales were $8.6 billion while gross profit came in at $3.0 billion. Net sales away from video games in 2016 came from three areas, the first two of which GameStop sees as driving growth in the future while the third has declined slightly in sales but offers margins of 70-85%. Technology Brands Stores: Spring Mobile AT&T and Cricket Wireless, along with Simply Mac ($814 million). Collectibles: Via GameStop stores, US ThinkGeek stores and online and international Zing Pop Culture stores ($494 million). Digital Products: Content downloads, software downloads, etc. ($181 million). GameStop’s continuing shift is also seen in plans for its portfolio of stores in 2017. Recent reports have GameStop closing 2% to 3% of stores worldwide – a number that currently sits as 7,535 according to Chain Store Guide’s Database of Discount, Dollar & Specialty Stores. In its annual report, company executives put the number at approximately 165: 130 GameStop locations and 35 Technology Brands stores. The 35 Technology Brands closures will be offset by 65 Technology Brands openings for the year. In addition, the company plans on opening 35 collectibles stores (ThinkGeek and/or Zing Pop Culture). Although the company has yet to provide additional details, the 35 Technology Brands closures may be comprised of additional Simply Mac store closings. The company has already closed 20 Simply Mac stores this year, reducing its footprint from 70 to 50.